Speed Dating. Yes this is my most recent adventure, there is never a dull moment when you're college and need a break from studying. Most people maybe unwind with a nap, a movie, granted most college students probably party... but not me and my housemate... we speed date. So I know what you're thinking... did you really have fun? And honestly, yes I did. Now no it wasn't really because the options of boys but granted I am sure they weren't happy with me either. In fact there was a time where no one came and sat with me and my friend. Legit our speed dating consisted of at least 20 minutes of the three hours where no one was sitting in front of us. Guess we scared the guys away? 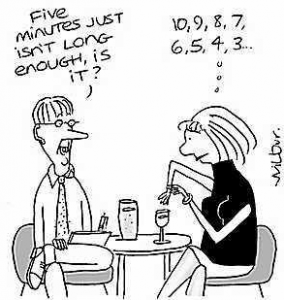 It's fun to say that I have experienced speed dating once though. Sure nothing came of it, and honestly I am perfectly fine with that. It was a fun experience to say I had. I thought I would conclude this post with a few observations and stories of my two second dates. A guy brought out a ring and told me how he had it in his pocket to give to the perfect girl when he met her. I am slightly offended I was not given that said ring.... hahah. I met a blogger! He was completely enamored with the fact that I blog just like him. He also is a theatre major and proceeded to say let's get married.... boys don't worry I am still single. A guy waisted no time and asked my friend out, which I actually admired. About time guys man up and ask the girl out and don't stare at the girl the whole time. Just do something. So do you have any crazy dating stories to share? Speed dating or not, it's always fun to share stories and compare how you handled the situations. Share them!